Black-and-white Copier and Printer. Scan and send fax in color or black-and-white. Postscript 3™ emulation (PE120i) and PCL6. First page out time in less than 10 seconds. Up to 3 paper trays including the bypass tray. 50-sheet bypass tray for envelopes, transparencies or special media. Maximum paper capacity of 550 sheets. Maximum duty cycle up to 15,000 pages per month. 50 Sheet Automatic Document Handler allows you to copy large jobs. Scan-once-print-many technology increases the reliability of the machine and your productivity. Optical Character Recognition (OCR) and Image Editing Software are included to convert scanned images into editable text documents. 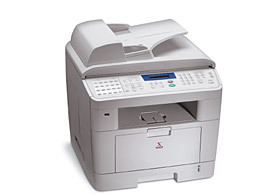 Powerful fax features include high-speed modem, JBIG compression, color or black and white transmission, speed dials and group dials. A large 300-sheet capacity, plus the ability to feed different types of paper. Add optional second tray for 550 sheets. Scan up to 8.5"x14" from the Automatic Document Feeder. Multi-tasking offers workgroups reliable, walk-up copying, efficient printing, high-speed faxing, color and black-and-white scanning all in one device. Scan documents to distribute copies instead of hardcopy saves paper and time. Multi-up prints multiple pages on a single sheet, saving paper. Toll-save faxing allows you to fax at a later time when the rates may be lower. Toner save mode extends the life of your cartridge and reduces your cost per page without a significant reduction in print quality. Toll Save allows you to save on call costs by sending a fax at a preset toll-saving time. Using this feature, you can take advantage of lower long distance rates at night, for example. Print reports to quickly get information like billing meters, system data, fax reports and scheduled jobs. Optical Character Recognition and Image Editing Software are included to convert scanned images into editable text documents. Push buttons gives you quick access to commonly used office features like Reduce/Enlarge, Collated, Lighter/Darker, Resolution and Color Originals. Stop/Clear button to cancel the printing job at the device instead of going back to your computer. Multi-Up enables printing of more than one page on a single sheet. One-up, two-up, or four-up printing on the same page. This environmentally friendly feature decreases the consumption of paper and toner. Poster allows you to print a single-page document onto 9 sheets of paper, for the purpose of pasting the sheets together to form one poster-size document. Watermarks provide the ability to print text, such as "Draft" or "Confidential," in the background of every page of a document. Autofit automatically scales a page, when copying to best fit the sheet size of the media in the designated input tray. Reduce/Enlarge your originals copied from 25% to 400%. Fit to page can scale your print job to any paper size regardless of the original document size. ControlCentre provides access to the device through a PC interface to manage paper trays, obtain meter information, fax setup capabilities and to upgrade firmware. Main Tray: Minimum: 98 x 148 mm/5 x 7 in. Main Tray: Maximum: 216 x 356 mm/8.5 x 14 in. Bypass Tray: Minimum: 76 x 127 mm/3 x 5 in. Bypass Tray: Maximum: 216 x 356 mm/8.5 x 14 in. 450 x 435 x 457 mm/ 17.7 x 17.1 x 18.0 in.